These glass Irish salt and pepper shakers feature pewter emblems with Celtic knots. Sorry, this item is sold out for the season. 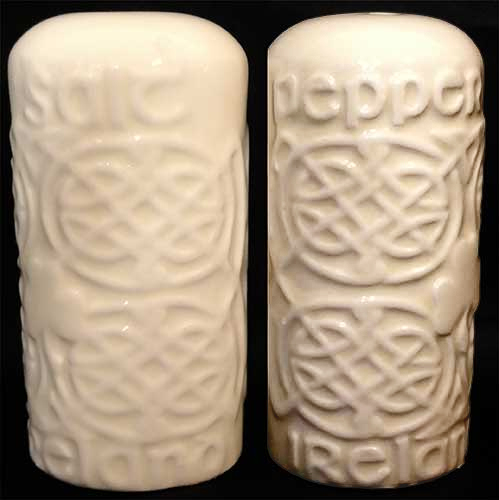 These Celtic salt and pepper shakers feature knot-work on pewter emblems. The Celtic knot salt and pepper shakers are made of green tinted glass with metal tops and they measure 1 3/4" wide x 3 3/4" tall. The Irish salt and pepper shakers are gift boxed with a Celtic knot history card that is complements of The Irish Gift House.